The geo-communications and spaced-based remote sensing industries are being disrupted by a new generation of satellite constellations and their greatly expanding commercial communications capabilities, geospatial data availability, and defense signals intelligence architectures. Buried deeply within these emerging satellite constellations, High Strain Composite (HSC) antennas are poised to touch people on a global scale as the new orbiting gatekeepers of information technology. The HSC industry has grown from laboratory experiments on composite carpenter tape springs to mission-critical components on satellite constellations in just over a decade. Roccor, the global leader in HSC deployment systems, has already secured a contract with an undisclosed satellite operator to provide HSC Solar Array Development Systems (SADS) for that firm’s fleet of more than 900 satellites. The deployable structures are incredibly simple with few parts and are derived from technology exclusively licensed from the Air Force Research Laboratory (AFRL) . The technology was further developed under the U.S. government’s Small Business Innovation Research (SBIR) program. More importantly, the technology is proving critical to the challenge of designing high-performance, low-cost deployable antennas for these satellite constellations. In 2012, researchers at the University of Southern California (USC) launched a 3U CubeSat called Aeneas to prove the concept of tracking cargo containers on a global scale using a cubesat constellation. Supported by the DoD Operationally Responsive Space Office and AFRL, Aeneas included a 0.5 meter in diameter deployable mesh antenna pointed to within a 2 degree accurate ground track. While Aeneas was the first-ever demonstration of cubesat attitude control and pointing to this level of accuracy, unfortunately the antenna — a mechanically complex design derived from traditional large-scale folding rib antennas — may not have fully deployed as the system failed to demonstrate the desired data link-up on orbit. As mega-constellations inch closer to becoming reality, the industry is closely analyzing recent antenna technology demonstrations such as Aeneas and learning valuable lessons that are leading toward simpler and more-robust designs for small satellite antennas that can be produced in high volume. The team at Roccor is working diligently through partnerships with top-tier antenna system companies to deliver such designs. In fact, Roccor is currently working with one commercial partner to flight qualify a more robust cubesat mesh antenna design than Aeneas, which will be deployed using HSC components. To be practical, these small-scale antennas must have much simpler mechanical designs than larger, traditional, satellite antennas. HSC structural elements — which can provide deployment actuation and damping, deployed stiffness, and integrated electrical/RF functionality in one multifunctional part — open an entirely new design space, which can lead to different antenna architectures and structural designs. 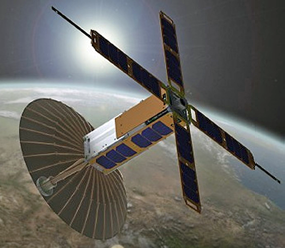 Artistic rendition of the Aeneas satellite. Image is courtesy of USC. To exploit this design freedom, Roccor has found that co-engineering of the HSC components with the antenna system is key and the best solutions evolve when the HSC engineering team works in tandem with the antenna and spacecraft engineering team to co-engineer starting at the point of requirements definition and through to final product realization. Designing deployable structures with HSC elements is quite different from using traditional mechanisms and experienced mechanism engineers can find it difficult making the transition. Traditional designs with fixed hinge lines give way to more flexible configurations using “floating” hinge lines or furlable, rather than rigid, members. The result is an antenna that packages and deploys more like a flexible camp chair and less like a rigid card table chair. The HSC element in Roccor’s SADS system has integral hinges and wire harness and packages for launch in a very compact volume without any moving mechanical parts (other than launch tie-down and release mechanisms). On orbit, deployment is triggered with a simple release firing signal, and driven by the strain energy packaged within the deformed HSC boom. Once deployed, the carbon-fiber boom straightens to provide substantial stiffness and strength while being relatively insensitive to thermal loading from the sun. With flight heritage being proven on solar array systems, HSC laminates have evolved from relatively simple constructions to highly engineered designs capable of meeting conflicting requirements for deployable antenna applications. For example, latest-generation HSC laminates accommodate high packaging strains while having a near zero-CTE and extremely high deployed stiffness to remain dimensionally stable after deployment while supporting high compression loads as they tension critical antenna elements. Creep of these polymer matrix composites and the concern over how they will perform on orbit after months or years of storage is perhaps the greatest concern among antenna system engineers. As such, years of development have yielded clear standards that are now being systematically applied for flight qualification of designs that accommodate these effects. 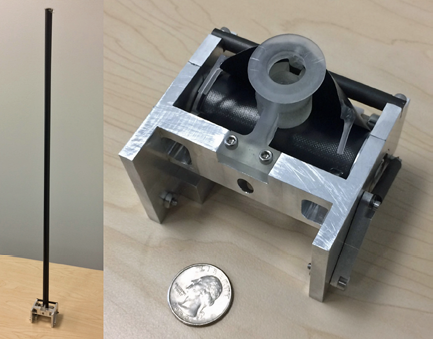 Roccor HSC instrument boom for NASA cubesats. In the recent Decadal Survey of Space and Solar Physics, the National Research Council urged NASA’s heliophysics community to consider whether future space weather missions, such as the Geospace Dynamics Constellation, might best be done with lower-cost cubesats. Since then, Roccor has worked closely with NASA engineers to adapt HSC technology to very simple high-precision, low-cost deployable instrument booms and systems capable of measuring precisely the variations in Earth’s ionosphere due to solar flares. These geomagnetic storms can block space-based radio communications, and degrade the performance of these new constellations of information technology. So, flying among the armies of HSC antennas will be HSC space weather sentinels to sound the alarm when the high-flying information grid goes down.